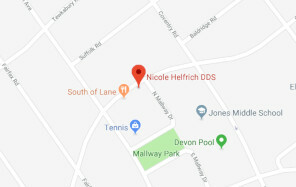 Upper Arlington dentist Dr. Nicole Helfrich recognizes that the health and care of your child is of the utmost importance to you and your family. 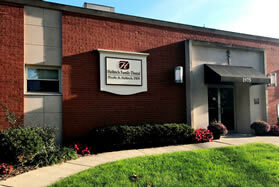 We strive to make our office, located in Upper Arlington, a friendly and comfortable environment for patients of all ages including children. There is nothing more important to us than ensuring that your child receives the highest quality of dental care and leaves with a smile. Sealants are protective coatings that are applied to the chewing surfaces of teeth in children. Sealants are quick and easy to apply and require no anesthetics. When permanent teeth erupt into the mouth between ages 6-14, Dr. Helfrich may recommend “painting” the chewing surfaces of these teeth with a sealant material that acts as a protective shield. The chewing surfaces of teeth have deep grooves, fissures, and pits that are susceptible to cavities. If indicated, Dr. Helfrich may recommend sealants to prevent food from accumulating in these deep crevices and to discourage cavities from developing in these hard to clean areas. A professional dental application of fluoride is highly recommended for patients of all ages, but especially in children. Fluoride is a naturally occurring mineral that makes teeth less susceptible to decay. Fluoride can even reverse the early stages of tooth decay by remineralizing enamel. When applied topically to the outer surface of teeth, fluoride acts as a protective shield that helps counter the acidic breakdown of sugars by bacteria. Stainless steel crowns are indicated for primary or “baby” teeth in children when significant tooth structure is lost due to decay. These crowns provide extra strength to primary teeth so that the tooth can be maintained until the permanent tooth is ready to replace it naturally. A pulpotomy is a root canal for primary or “baby” teeth. When decay within a primary tooth is extensive, a pulpotomy is performed to save the tooth from an unnecessary early extraction. A pulpotomy is a short procedure where the decay and bacteria are removed from deep within the tooth. After a pulpotomy is performed, a stainless steel crown is placed to protect the tooth from further decay. When a primary tooth is lost early, a space maintainer may be needed to ensure there is sufficient space for the permanent tooth to erupt. If space is not maintained, permanent teeth may shift creating a bite problem later in life. When should my child first be seen by a pediatric dentistry practice? The American Dental Association recommends that children be seen by a dental professional by the first year of age. Dr. Helfrich can provide you with important resources of information about primary and permanent tooth eruption patterns, dietary and nutritional effects on oral health, and brushing recommendations. Acclimation at an early age with the dentist and dental office can help lessen or eliminate any future dental anxiety. We strive to make your child’s visits with us fun and enjoyable! Parents are encouraged to lightly brush their children’s teeth as they come in. An age-appropriate soft-bristled toothbrush with a smear of fluoridated toothpaste should be used for a child less than 2 years of age. Kids between the ages of 2-6 years should only use a pea-sized amount of toothpaste when brushing. Young children should be supervised when brushing and taught to spit, not swallow, toothpaste. Are thumb sucking or pacifier habits harmful? Habits such as pacifiers and finger or thumb sucking typically disappear without any intervention, but these habits can become a problem if they continue after the age of 3. Persistent habits can have harmful effects on the teeth as well as the growth of the jaws. Dr. Helfrich may recommend a mouth appliance to help eliminate these habits. How does diet and nutrition affect my child’s teeth? Limiting foods high in sugars and starches can help prevent tooth decay. When bacteria (plaque) break down these types of foods, acid is a byproduct that slowly dissolves away the outer surface of teeth. For the same reason, a high consumption of sugary and acidic drinks, such as soda or pop, is discouraged. Replacing these drinks with tap water is recommended because it flushes food away from the teeth and contains fluoride which can actually reverse the early stages of tooth decay. If a permanent tooth is knocked out, hold the tooth by the crown, not the root, and try to reinsert the tooth into its socket. If this cannot be done, place the tooth in a glass of milk, and take your child and glass immediately to a dentist. Sports-related injuries are common causes of tooth displacements. Mouthguards are recommended to protect a child’s teeth, gums, and jaws. Our office can provide you with a custom-fitted mouthguard that can help prevent injury.